Buffy’s final days at Sunnydale High couldn’t be over without a trip to the prom. Buffy the Vampire Slayer Season 3 Episode 20 added a fun supernatural spin to this high school staple. But, it’s the strong character moments that put this plot on top. Firstly, the dissolution of Angel and Buffy’s relationship hits right to the heart during every viewing. Throughout Buffy the Vampire Slayer Season 3, the show kept a consistent theme going of showcasing the barriers that pulled the couple apart. Between Buffy getting jealous of Faith and Angel’s connection to their inability to experience intimacy, one new hurdle kept coming after the other. The fact that they weren’t “endgame” was teased as a real concern. Mayor Wilkins’ speech during the midnight trade offered the most direct explanation. If the current Big Bad, who would’ve gladly seen the couple murdered, took the time to eloquently present the challenges they’d face in their lives for their betterment, you knew the situation was direr than they even realized. Angel and Buffy weren’t meant to be. So, their romantic post-slaying cuddle sessions was a complicated red herring that hid the trouble brewing underneath. Even if they looked super cute together. By this point in their relationship, Buffy was head-over-heels in love with Angel. If we ever needed a reminder that Buffy was a teenager, the scribbles on her notebook proved that. She couldn’t see the real future ahead of her. Only a true love with Angel was her daydream. I don’t consider Joyce the main trigger for the break-up. Her conversation with Angel, while factual and direct, merely added another layer to the growing concern that built up beforehand. Angel already feared his future with Buffy. In this case, the chat placed all the cards on the table to the point that he couldn’t avoid the truth any longer. Joyce reaching out to Angel is one of my favorite moments from her character’s history. Joyce: I don’t have to tell you that you and Buffy come from different worlds. Joyce: She’s had to deal with a lot, grow up fast. Sometimes even I forget that she’s still just a girl. Angel: And I’m old enough to be her ancestor. Joyce: She’s just starting out in life. Angel: I know. I think about it more now that she’s staying in Sunnydale. Joyce: Good. Because when it comes to you, Angel, she’s just like any other young woman in love. You’re all she can see of tomorrow. But I think we both know that there are some hard choices ahead. If she can’t make them, you’re gonna have to. I know you care about her. I just hope you care enough. Permalink: I don’t have to tell you that you and Buffy come from different worlds. After her ongoing hesitation, she came around to accepting her daughter’s Slayer duties. The journey had a lot of bumps and many moments where she fought back against the responsibility Buffy faced. But at the end of the day, Joyce understood the path. Here, she stood up for the small semblance of the future that her teenage daughter could have. Sure, the odds of a Slayer living to old age were slim to none, but at least Buffy could enjoy it with someone who could experience the world with her. Joyce made sure to keep that possibility alive, even if Buffy’s boyfriend wasn’t. Joyce made a huge move for her daughter. It’s one of a few times where issues from the mortal world superseded those of the supernatural. Also, Angel’s nightmare of his disastrous wedding with Buffy didn’t help. When I was a kid, I figured the wedding had to be a red herring, like a dream. The wedding scene appeared out of nowhere after an earlier chat, and there wasn’t a single person in that church. Regardless of drama, Buffy wouldn’t have a wedding without her friends. Though, the twist of Buffy bursting into the flames provided an interesting twist. Angel, as a vampire, feared the death of dying in the sun. So, to have his nightmare of Buffy’s death be of her disintegrating in the sun, this scene offered a great comparison to his worst-case scenario. When it came to the break-up itself, Angel handled it all in the worst possible way. He made the end of their relationship more heartbreaking and uncomfortable than it needed to be. Why did he have to do it in the sewers? And, why did he also mention that he planned to leave town too? That added two emotional nails in this coffin. Even though Buffy forced him to come clean, he could’ve kept his composure together until they finished patrolling to end things at home. Buffy didn’t need to feel anymore hurt from this heartbreaking decision. Buffy: I don’t care about that. What brings on the tears from this moment was Sarah Michelle Gellar’s talent, and how she drew from such raw emotion to capture Buffy’s devastation. You could feel the breaking of Buffy’s heart as she realized that Angel was ending their relationship. The pain slowly built over time until the chord was cut; that progression showed brightly on Buffy’s face. Pairing this break-up scene with the post-scene of Buffy breaking down in tears to Willow made it an impactful moment for the character. At that moment, her world was ending. Buffy: That’s it. Assuming we survive this Ascension thing, he’s gonna leave town. Willow: Well, he’s a fool. He’s just a big, dumb, jerk person. If you ask me. And he’s a super, maxi-jerk for doing it right before the prom. Buffy: That’s not his fault. He’s 243 years old. He doesn’t exactly get the prom. Buffy: Wil, it’s okay. You don’t have to make him the bad guy. Willow: But, that’s the best friend’s job. Vilifying and grousing. Buffy: Usually, yeah. But he’s right. I mean, I think, maybe in the long run, that he’s right. Willow: Yeah. I think he is. I mean, I tried to hope for the best, but… I’m sorry. Must be horrible. Buffy: I think horrible is still coming. Right now, it’s worse. Right now, I’m just trying to keep from dying. Buffy: I can’t breathe, Wil. I feel like I can’t breathe. Permalink: He’s 243 years old. He doesn’t exactly get the prom. It makes their final dance at the prom even more heartbreaking since it was one of their final happy moments together before he left. The break-up felt realistic and human for a supernatural TV show since there was no other reason pulling them apart; it was a decision between two people in a relationship. A union that simply ended. This is one of Buffy the Vampire Slayer’s best break-up scenes; if not THE best. Framed around the side-plot of the break-up was the big event itself: the prom. As well as the Monster of the Week story featuring the student trying to ruin all the fun. Obviously, Willow and Oz were going to go together; that coupling was set in stone. 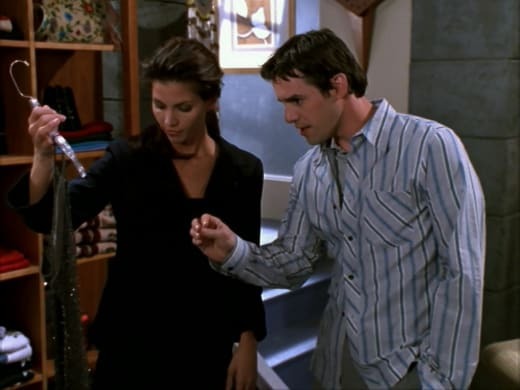 But, the early pairing of Xander and Anya together created lots of random fun that blessed us with a pairing we didn’t know we needed in our lives. Right from the first awkward ask, Anya and Xander’s chemistry shined right through. What should’ve been a simple dating ask morphed into a sarcasm-enriched conversation that highlighted the future couple’s fire and pettiness. The combination worked; it’s no wonder this plot developed into a four-season long romance story. And all of it started due to a desperation to not go to the prom alone. It’s funny to think that just 11 episodes earlier during Buffy the Vampire Slayer Season 3 Episode 9, Anya was cursing Xander for his infidelity woes with Cordelia. Their storyline went full-circle for a night they’d never forget. On the opposite side of the spectrum, Xander and Cordelia’s story found a calm resolution. Their past tension and animosity disappeared after he kept Cordelia’s secret of her family losing their money. After all the pettiness they threw at one another, him protecting his ex seemed like an unthinkable idea. He had all the ammunition to retaliate, but he didn’t do it. I’ve had my issues with Xander before, especially with his misogynistic attitude. However, this moment might be one of his more compassionate and civil decisions. And one that needed to happen since Cordelia was going to leave the show. It’s a shame that Cordelia lost all her money and couldn’t go to any of her dream universities. BUT, she did get to prosper as a character and star on Angel. It’s a changing balance of opinions here. The Monster of the Week featured geeky Sunnydale High outcast, Tucker Wells, who wanted to seek revenge for getting rejected as a prom date. That’s it! No complex story that raged fire and demons from hell. No mystical ritual that required the blood of his classmates. Just a frustrated teen who didn’t want to go to the prom solo. A fluffy and empty teen-focused plot can work for a one-off case like this. Sometimes we don’t need a grand apocalypse or conspiracy to take center stage every week. And if we’re dissecting the plots here, Tucker’s prom woes weren’t the main focus of the episode anyway. The plot relied on Buffy’s breakup with Angel, and the group getting the chance to celebrate one last hoorah. Tucker didn’t make much of a difference. 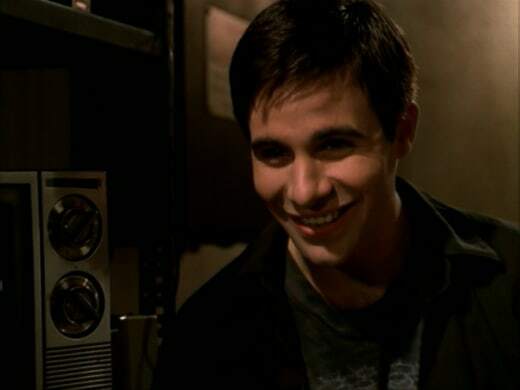 I’m also happy that we ended up getting his younger brother Andrew as one of the villains for Buffy the Vampire Slayer Season 6 instead. A much better trade-off to have his brother as a character. Now, let’s get to the next emotional parts that hit me like a ton of bricks. First up: the “Class Protector” award. How can you not cry during this? Buffy is enjoying her prom, she’s looking amazing in her STUNNING pink dress, and then Jonathan steps on stage to deliver his speech. Every single word of that iconic speech had an emotional connection to it that pulled on your heartstrings. Especially if you followed Buffy’s adventure since Buffy the Vampire Slayer Season 1 Episode 1. 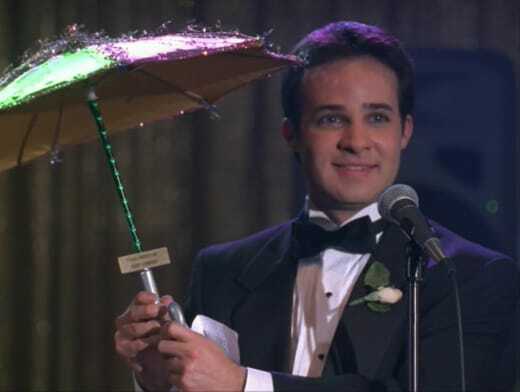 Jonathan: It’s from all of us, and it has written here, “Buffy Summers, Class Protector”. You could tell that Buffy felt seen and appreciated for the first time. The speech answered a burning question that we viewers had for years: did her fellow classmates notice the supernatural events happening around them? They did. And, they knew that Buffy stopped it and saved their lives. This moment is important because not only is Buffy recognized for her goodwill, but she’s recognized for making a difference too. A Slayer’s life is one of forced duty, solitude, and no honor. Buffy was appreciated by the people she saved and who’s lives will eternally be changed because of her. 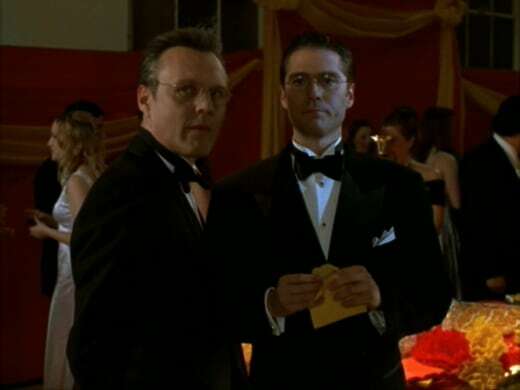 Lastly, Angel showing up to the prom in all his tuxedo handsomeness and having a final dance with Buffy gets me every time. Sure, the moment is cliche, cheesy, and somewhat predictable … but I don’t care. Let’s welcome this rom-com moment with open arms and bask in the emotions. We won’t be getting many other tender ship moments left. But, if there’s anyone I want to blame, it’s the music editors for choosing “Wild Horses” by The Saturdays as the slow dance song. It’s perfection. Now, over to you, Buffy the Vampire Slayer fans! What did you think of “The Prom”? Did you cry when Buffy won the award? Would you have gone to the prom with Anya based on her ask? Did Joyce do the best thing possible for Buffy’s future? Want to join us in rewatching Buffy the Vampire Slayer? We’ll be posting new rewatch posts on Tuesdays and Fridays. Come back here and share your thoughts in the comments below.